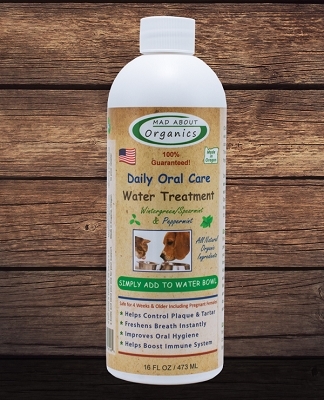 Understanding that many pet owners do not have the time to brush their pet's teeth everyday is one of the main reasons we developed Mad About Organics' Oral Care Food Additive for dogs and cats. It is an easy way for pet owners to care for their pet’s teeth and oral health who don’t have the patience or inclination to brush their dog or cat’s teeth regularly. The product comes in a powdered form and it is simply added on a daily basis to dry or wet food. Dogs and cats like the taste of the small amount that is added. Mad About Organics' Oral Care Food Additive does not rely on topical application or friction. The product is ingested and works systemically. This has turned into our number one selling products and for good reason, It WORKS! The natural compound in the product comes out through the saliva and works to break down the bacterial bio-film that forms on the teeth and gums. This is how the natural bacteria in the mouth take hold onto the teeth and gums, colonizing and creating the oral problems of plaque and tartar, bad breathe and gingivitis. It does not change the pH of the mouth or kill off the normal levels of bacteria. Garlic has been an ingredient that has brought up many questions from concerned pet parents. We would like to educate you on the benefits of our organic dried garlic powder and hope this relieves some of your concerns. Garlic is a natural antibiotic and won't effect the good bacteria in the gut which are needed for digestion and immune health. It is also anti-fungal, anti-viral, anti-parasitic and also helps boost the immune system. Staying away from high levels garlic oil or garlic powder has been proven to be beneficial without any side effects. Garlic powder helps detoxify and helps to balance the digestion system. This formula has also been proven to reduce plaque and tartar on the teeth and gums, depending on composition, diet and how long it has been there. It then works to prevent bad breath, plaque and tartar from returning. Patients generally begin to see results over a 2-8 week period, and will see further benefits with continued use. Healthy teeth and gums are very important for your pets. 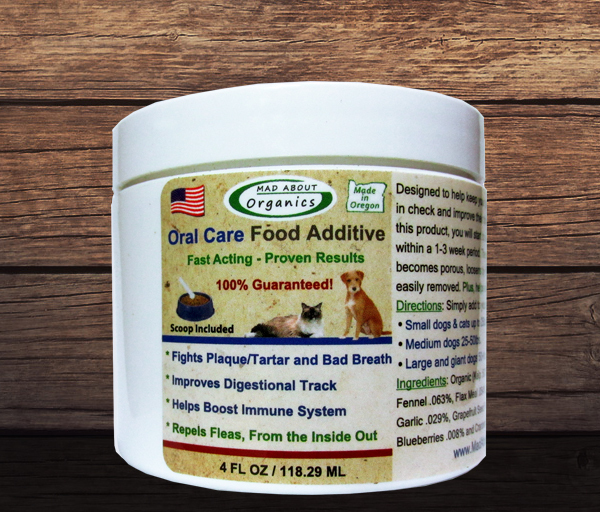 With the use of our Oral Care Food Additive, you will save an expensive trip to the vet and possibly your pet's life! Don't just take our word for it. Read about what others are experiencing with Mad About Organics' Oral Care Food Additive. "It's me, Janet Newcombe, manager of Celebrity Pets Holistic Care in White City. I'm writing to you this fine Saturday morning because I CAN'T CONTAIN MY EXCITEMENT! 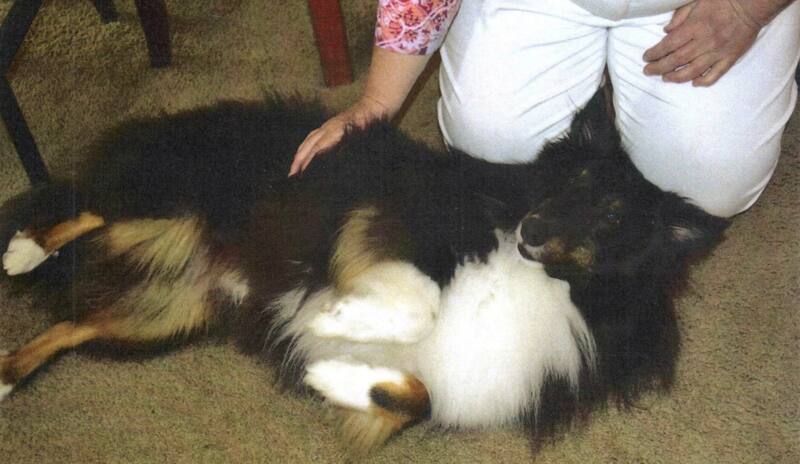 I have a 6 1/2 year old Sheltie Collie that has never been to the veterinarian for a dental. Anybody that knows anything about Shelties knows that they, like Poodles, are notorious for "soft" teeth. I worked for a vet that is WELL KNOWN in the tri-state area; and saw the trauma a dog goes through when getting a routine dental. That is what has kept me from having his teeth cleaned. WELL LET ME TELL YOU WHAT I SAW THIS MORNING! I have been diligent for approximately 2 weeks, adding the granules to his food in the a.m. & p.m. His canines look POLISHED & this "effect" continues throughout his ENTIRE MOUTH! I can't believe the difference that 2 WEEKS made! 2 WEEKS! We, at Celebrity Pets carry your whole line of products and are proud to do so. But this is the CRAZIEST thing I have EVER WITNESSED! I WAS COMPELLED TO WRITE AND LET YOU KNOW IMMEDIATELY. So THANK YOU M.A.O. You guys are THE BEST!" "This is from Stanley and Ollie Monaghan and their happy mom, Hannah. 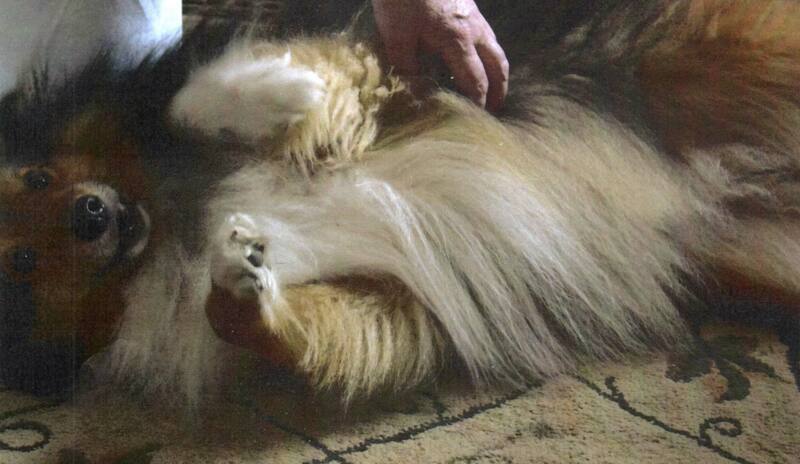 As shelties, we are prone to plaque and gum disease which makes it harder for our organs to stay healthy. Mom is mad about your products and after grilling Ben tried the skin relief first. We grew hair overnight and the rest was history. Today, after only a few weeks of gnoshing on carrots laced with the tasty gel, I, Stanley am plaque free on one of my molars. Mommy just peeled it off with her fingers. Ollie, my big brother and personal body guard is not far behind, but is taking longer because he gulps his food so he can try to eat mine. We are so happy Mom found you guys. Stick around." "Caution: Not recommended for animals undergoing treatment for hyperthyroidism"
We have also personally noticed that since adding this powder mix to our pets diet once a day, they have stopped getting fleas. The non-active brewers yeast and small amount of garlic is what is contributing to these results, which has become a dream come true for us and all of our animals. With these ingredients added into their food on a daily basis, it builds up in their system and helps keep the biting insects from wanting to feed on them. Even though we originally did not design this product specifically for this, it has been a wonderful bonus. We know this is not always the total solution in everyone's situation, but has made a huge difference in our pets lives and we hope yours as well. 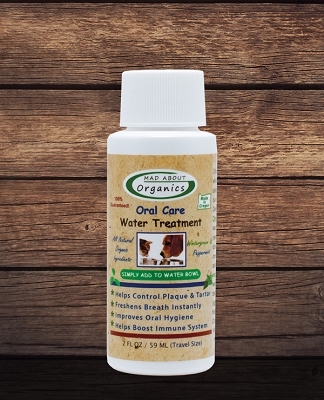 For your pet(s) total dental protection and health, we also recommend the use of Mad About Organics' Oral Care Herbal Gel and our Oral Care Water Treatment which is simply added to their water dish each time you refill. i don't have a title! i just started using this for one of my newer dogs who came with plaque encrusted teeth. last night i noticed that not all her teeth are covered now! we have a ways to go but its working! i now add it to my other dogs food as well. maybe i won't have to brush every night now. thank you! Love this product !! I have 3 small breed dogs all up in age 10 and 12. This product has been working real well on the oldest. I couldn't take a chance on oral surgery at 6 pounds and age I feared he wouldn't survive. Thank you for making this awesome product. I have friends purchasing this now. Everyone has been very happy. I have been using Oral Care for several months. There is a real difference in my dogs' teeth. Less plaque has built up and fewer brown tinge at the gum line. I highly recommend this product. Oh, and it smells great! I apologize for the late review, But I was actually surprised that the product worked and wanted to make sure that what I was seeing was genuine. Well, it is. I can’t tell you how much I appreciate the fact that I no longer have to subject my cat to dangerous chemicals to ward off fleas and ticks. This product works 100%. My cat is healthier and happier this year without the flea and tick meds from the veterinarian. Unfortunately, I’ve only noticed a slight change on the Torture on his teeth but any change is better than none. Regardless, I will continue to purchase this product. I’ve also noted that His fur is shinier. Thanks for a great product! I've been using this product for years and I love it. 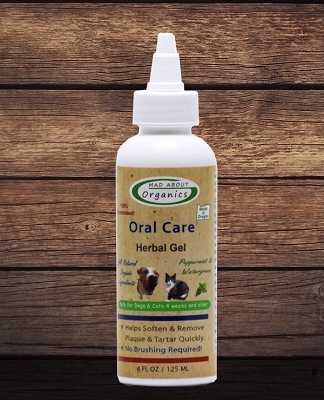 It helps control the tartar on my dog's teeth and keeps their breath fresh. Been using this product for 4 years now. My Mini schnauzer teeth are in excellent shape for 4 year old according to my vet. Excellent product wonderful company. This is an amazing product. My Pekingese was about to have surgery for teeth cleaning. She is 13 and going under anesthesia was something I was concerned about. I did some research and found this Mad About Organics plaque remover and it works. Absolutely incredible product. I will be telling all my furry friend owners about it and thank you Mad About Organics for making this available to us. Very much appreciated!!!! All the best. My daughter-in-law introduced me to this product. I have been using on my dog Lucy for last 9 months. Took her to vet for checkup and he wanted to know why her teeth are so clean. He asked for product info. to pass on to his other clients. WOW, It actually works. Our dog's 11 years old and until recently always had white teeth and sweet smelling breath. We looked at him one day and his teeth were yellow, Well after a couple month's on the Organic Oral Care Food Additive his teeth are so bright and white we might need to put on sunglasses. He loves the taste mixed in with his food.Highly recommend this great product. We ordered the trial size first to make sure he would eat it in his food. So glad they had that size available. 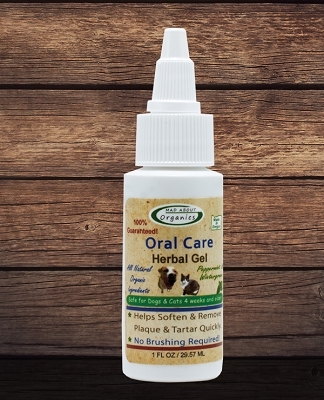 This product does a fantastic job of loosening the plaque on my dogs' teeth. They love the taste, as well, so it isn't difficult to give to them. I will continue to use this product. My little Amelie LOVES this stuff! In fact she is so crazy about it that when I sprinkle it on a vitamin pill or other meds she must take, she gobbles up everything! So little but so effective. My boy gubbles up his food and it is sprikled on top. His teeth and breath are great. I've been using it for 6 months. I have 2 Papillons who are prone to tarter build up. The little one has had to have teeth removed before he was 5 years old. 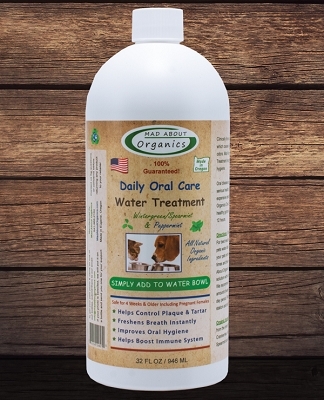 Since I have started using the Organic Oral Care Food Additive my vet has been amazed at how little tarter build up there has been. We have not had to do a cleaning since. The vet even asked for the product info so he could order it. I have been using this product for at least 3 1/2 years both dogs have no digestive issues and we haven't ever had fleas or a tick since using this product and I live in a very heavily wooded area. My dog LOVES this and it smells so healthy. It has so many benefits. I will definitely continue to purchase. We had originally purchased this item at a local pet store who is no longer carrying it and we have been thrilled with the results. Our Cocker Spaniel had a great exam with her vet who said her teeth were is great shape, so no expensive teeth cleaning bill. Would highly recommend this to any one. Excellent line of flea and tick products!!! Q: When adding to dry food: Do you mix it with water? Or just dust it on the kibble? I use a soft kibble by pet fresh for my kitty. A: Hi Jessie, thank you for reaching out to us. With our Oral Care Food Additive, all you need to do is mix into your pet's dry or wet food and let them enjoy. We recommend mixing it in, so that when eating their food, just like us you don't want to get a full bite of the seasoning. Mixing it around helps disperse the powder so that it is not too strong of flavor. Hope that makes sense, but if you have more questions please feel free to let us know. Q: We have a 7 mo old Brittany (25 lbs). Is she too young to start using your "oral care food additive"? A: Yes, all of our products that we make are designed for 4 weeks and older including pregnant females. Thank you for asking. Hope this helps your decision in purchasing this product. Mad About Organics Food Additive should be added to dry or wet food on a daily basis. Each item contains a serving spoon to measure out the proper amount. Our scoop size is 1/8th of a teaspoon, so a little goes a long way.